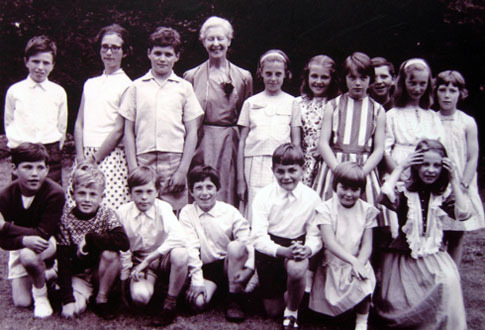 This photograph of Head Teacher Mrs Victoria Stirrat with her senior class was taken in 1963, probably at the end of a village fete. It will be added to other school photos in the relevant section of the website photographic archive. See a larger version with the names of the children where known. Any corrections or additions to this information will be gratefully received. This entry was posted on Thursday, August 18th, 2011 at 3:47 pm	and is filed under News. You can follow any responses to this entry through the RSS 2.0 feed. You can leave a response, or trackback from your own site. Hello all – and Collin! Also, a querie as to the date of the picture…. In 1963, I would have been only 6, turning 7 at the end of September….. I think this is more like 1965…. Not that it really matters, I suppose.. Anyway, I have so enjoyed seeing it and remember all those faces so well. I just loved Mrs. Stirrat. I think the school pupils in the group photo had performed some maypole dances at the village fete. I was already at the High School in Brackley, so Liz Roullier is correct in thinking it was most likely 1965. I remember Mrs Stirrat asking me if I would step in, at short notice, as she needed an extra dancer. I think that the other un-named girl may be Caroline Deeks.